Outside, a rustic village house with the original stone facade, inside a small, very sophisticated apartment of modern design. 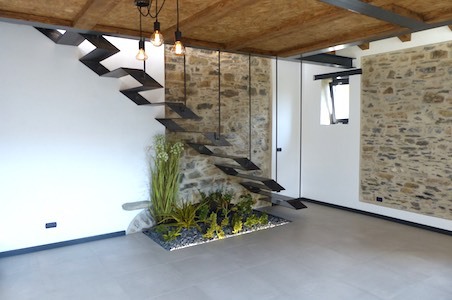 The high-quality finishes and technology skillfully matches with a material mix of slate, metal, wood and stone walls, creating a modern ambience that fits perfectlyexcitingl originally rustic, twisty architecture. The ideal apartment for 2-3 persons! First ers after a complete renovation. The living area of approx. 65 sqm extends over two levels. Large sand-colored floor tiles run through the whole apartment. A slightly steep staircase leads from the street to the front door with a small forecourt. From the entrance you enter the living room of approx. 25 sqm with two exposeda natuawalls and the connections for an open kitchen. Three steps lead to a hallway a little higher, right to the spacious, bright bedroom with a little french balcony. At the end of the narrow corridor, there is a large, gorgeous bathroom with a walk-in shower and double sinks. 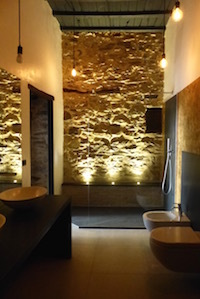 Stone walls and a top modern equipment of excellent quality blend harmoniously into a sophisticated ambience. A modern metal staircase, with a plant island underneath, leads from the living room to the upper floor and to a small mezzanine with room for a child’s bed. Opposite a sink and a narrow toilet with shower. On this floor, you step out onto the sunny terrace of approx. 10 sqm, equipped with flowerpots and integrated irrigation system. It faces south-west and offers a beautiful view of the opposite side of the valley, the green hills and the neighboring village houses. The apartment is located on the first floor of a Ligurian village house, just next to the main road and only a few steps away from the grocery store, public parking places and the bus stop. Isolalunga is an ancient fraction of Dolcedo, a very sunny village even in winter and one of the most beautiful places in the Valprino valley with many medieval buildings and small alleys. The village offers a small grocers and is located in walking distance (about 400 m) to Dolcedo, the central village of the valley with various shops, restaurants, kindergarten and elementary school. The coastal town of Imperia with its beaches, numerous shops and one of the largest tourist ports on the Riviera is about 7 km away, the airports of Nice and Genoa at approx. 100 km. Distances: about 7 km away from the beaches and the nearest town (Imperia).